Hudnut et al. (2009) used TLS to investigate a previously undocumented Precariously Balanced Rock (PBR) located above Echo Cliffs in the western Santa Monica Mountains. The rock lies above the ramp in the fault propagation fold structure that has been interpreted by Davis and Namson as an active structure that may pose a major seismic hazard to the Los Angeles area. The Echo Cliffs PBR stands at just over 14 meters in height, so assuming it acts as an inverse pendulum, it has a 3 to 4 second period of oscillation. This period corresponds to the oscillatory period of a 30 to 40 story building. The rock withstood ground motions during the 1994 Northridge earthquake that we estimate to have been 0.2 g (PGA) and 12 cm/sec (PGV) at this site. It is expected that the Echo Cliffs PBR may provide important constraints on scenario ground motions and thereby improve future simulations. The high resolution TLS data allowed the team to characterize the detailed shape of the PBR itself, as well as key details of the interface between the rock and pedestal at the cm-level. In addition, the cliff band near the PBR and the geomorphic context of the surrounding hill slope area was also scanned at a coarser resolution, providing data that help to understand the processes by which the PBR formed. An advantage of TLS is that it provided an image of the outline of the rock-pedestal contact surface and adjacent non-contacting surfaces. The TLS also helped quantify the effects of shielding on cosmogenic nuclide production, enhancing the accuracy of our surface exposure age dating. 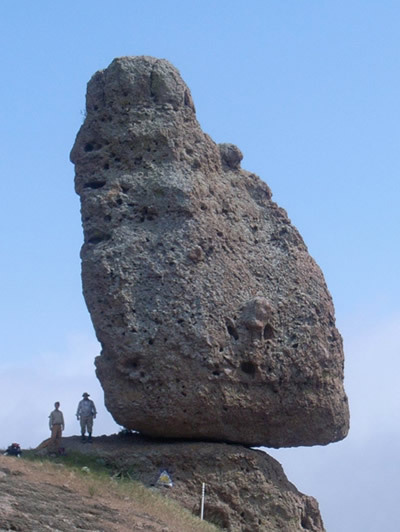 Figure 1 - Photograph of the precariously balanced rock (PBR) at Echo Cliffs in southern California. Courtesy K. Hudnut, G. Bawden and S. Bond (USGS). 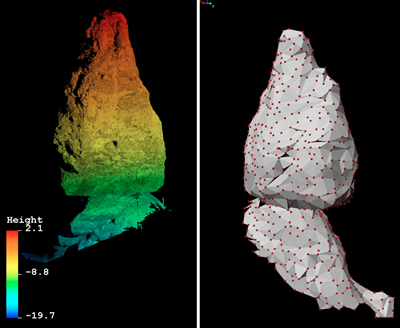 Figure 2 - TLS derived point cloud colored by height (left) and TLS derived 3D surface model (right) of the precariously balanced rock (PBR) at Echo Cliffs in southern California. Courtesy K. Hudnut, G. Bawden and S. Bond (USGS).